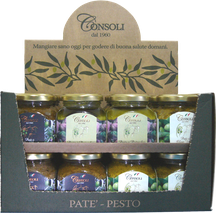 The black olive pâté is made using a traditional method with the best selection of table olives produced in our plant. 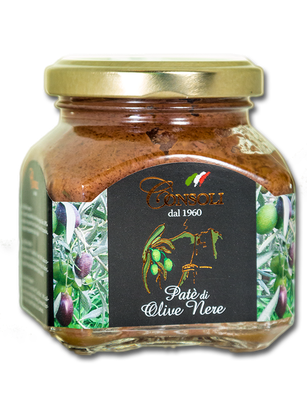 The black olive pâté is not produced using processing wastes, but using only choice products, and high quality ingredients such as 100% Italian extra virgin olive oil to obtain a delicious and refined pâté. Tonda Iblea and Moresca olives, 100% Italian extra virgin olive oil, vinegar, parsley, oregano, salt, garlic. On bruschetta, sandwich, pasta sauces and to season meat and wild game.